Refuge’s relationship with Avon started in 2007. Up until 2007 Avon, whose global philanthropy has raised and awarded more than $660million worldwide, had focused support on breast cancer charities; however, in 2004 the company committed to supporting more causes that impact women. At a UK level this meant Avon was looking for a new charity partner, which resulted in the team contacting Refuge. In the early stages of the partnership we spent time with the Avon UK team explaining domestic violence, the extent of the problem and how it affects women and children – as well as how their support could make a big and tangible difference to Refuge’s life saving and life changing work. In 2008, Avon launched the international Speak Out Against Domestic Violence campaign, an awareness and fundraising campaign which centred around the sales of the Avon Empowerment Bracelet. Refuge received 80 per cent of the proceeds from sales, with the remaining 20 per cent going to Avon’s global beneficiary Unifem. Following the great success of this activity, Avon agreed to continue its support for Refuge’s work. To build on the empowerment initiative, the Refuge and Avon teams decided to create a high profile awareness and fundraising campaign, which centred around "Four Ways to Speak Out" against domestic violence. 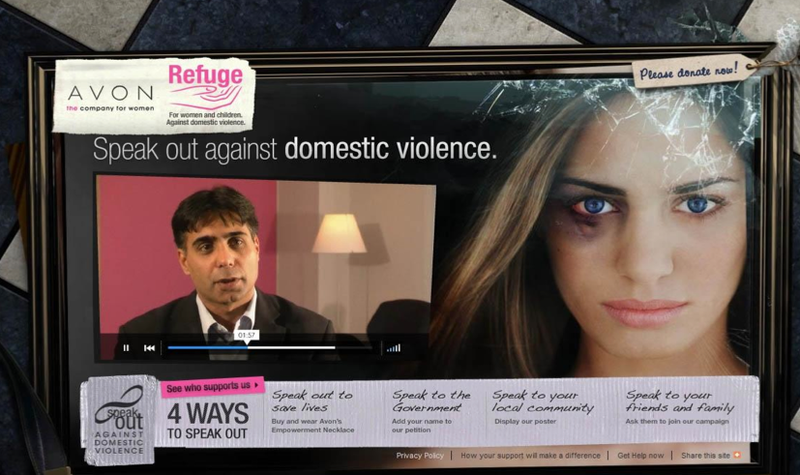 The campaign enabled Refuge to not only raise funds but to achieve its communications objectives (two fold: to reach out to women in need of services; to challenge negative attitudes towards domestic violence); it also helped Avon to reinforce its global Speak Out campaign against domestic violence. Domestic violence claims the lives of up to two women every week. The focus of the Four Ways campaign was to raise awareness of this fact, and give the public ways in which they could positively act, and speak out, to make a difference. Signing a petition urging Government to fund more specialist domestic violence services. Buying and wearing an Avon empowerment necklace to support Refuge’s work. Downloading and displaying the campaign poster to reach out to women. Passing the campaign on to friends and family. The campaign was supported by a hard hitting microsite, fourwaystospeakout.com. To ensure the campaign had an impact on people, we created a video which included a mother and two brothers talking about how the deaths of their daughter and sisters could have been predicted and prevented. These family campaigners gave the campaign a strong and compelling call to action. A campaign launch event was held on 25 November 2009, the International Day for the Elimination of Violence Against Women: we created a temporary memorial for the 72 women killed by a current or former partner during a given year by placing 72 female life-size ‘silhouettes’ in front of the iconic Tower Bridge. Refuge secured the support of more than 30 families who had lost women during this period and invited them to a reception at the site. The event was opened by Minister for Women, Harriet Harman, who spoke alongside a domestic violence survivor and a mother whose daughter had been killed by her former partner. Eight days later, an event was held at the House of Commons, hosted by Refuge patron Baroness Helena Kennedy QC. This was attended by actress and Avon global ambassador Reese Witherspoon, who held a press conference in support of the campaign. Reese’s support gave the campaign a very high profile second burst of awareness-raising activity, and helped to double support for the campaign. To sustain visibility after the launch period we were able to secure the support of our pro bono agencies, who very kindly devised and created a poster, press and digital advertising campaign. Over £60,000 worth of free advertising space was secured, which helped keep the campaign in the public eye. Alongside the launch events and marketing activity we have also been able to maximise the fantastic workforce of Avon and its thousands of representatives. The Avon team has been taking the campaign to their customer base on a one-to-one basis and also through the Avon customer brochure. This has helped drive huge awareness and traffic to the microsite. Overall the campaign received more than 300 individual pieces of media coverage, including several very high quality opportunities, such as: appearances on the BBC 10 o’clock news, BBC Breakfast and BBC Radio 4; large features in The Sun and The Guardian; an appearance on Friday Night with Jonathan Ross; and features in Look, You and Easy Living magazines. The campaign has been educational for us: we’ve found that when one of the key objectives is to drive people to a microsite, the best way to do this is to concentrate communications activity in a similar digital environment. Thanks to a fantastic article written by Refuge’s patron Patrick Stewart we received a high number of visits and sign-ups. This intelligence has helped Refuge and Avon to build a tailored programme of activity for 2011 which has a strong digital focus. The Refuge and Avon partnership has been a success because both parties were able to bring different assets to the table. The challenge for Refuge is to make something out of nothing – we have a skeleton team of two people and we start each financial year with a zero budget. All of our campaigns are done on a pro bono basis. However, we are incredibly lucky to have such a great profile thanks to the agencies and partners that support us. So although we can’t offer Avon a great deal in terms of actual investment or even team resource, when we package this alongside our extended partners and ambassadors we are able to reap amazing rewards. These resources, in addition to the support of patrons such as Patrick Stewart and Baroness Kennedy, enabled Refuge to come to the table with some valuable assets. Thanks to Avon and its huge customer base, its access to A-list celebrity Reese Witherspoon, its in-house team of experts and the PR agency support it secured, we were able to reach a huge audience, which translated into some fantastic and tangible results. The www.fourwaystospeakout.com campaign would not have achieved this success without Refuge and Avon having a mutual recognition and respect for what each party could contribute to the campaign. Together we were able to combine our resources and rollout a campaign which will save and change thousands of lives.